An interesting game with rather smooth animation. 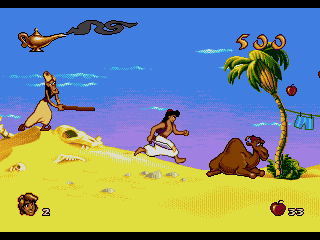 This tab is to keep progress on current and obsoleted runs of this game that have been accepted onto the site (already exists here: http://tasvideos.org/Game/genesis-aladdin-disneys.html ). Genesis Disney's Aladdin (USA) in 11:05.4 by ElectroSpecter. A typical Disney game featuring all the characters from the movie. This is an improvement of 3 minutes and 14 seconds over the previous movie. More detailed comments about the run can be found in author's comments. Genesis Disney's Aladdin (USA) in 14:19.73 by slash_star_dash. If you stop running a certain time during the latter part of Aladdin's running animation, he will skid to a stop. If you stop for only one frame (long enough to trigger the running animation) and begin running again, the X velocity of Aladdin's skid will be added to his running velocity, noticably increasing his speed for a short period of time. From a complete standstill, it takes 40 frames to initiate a skid, 41 frames when already walking and doing skids. Any animation outside of Aladdin's walk cycle will reset the skid counter, such as jumping or attacking. 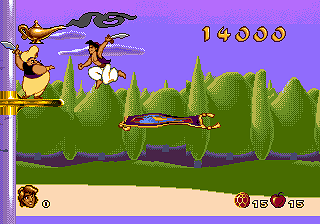 A variation of skidding, pressing the jump button before skidding activates makes Aladdin jump farther then usual.